As young children become proficient in subitizing (the ability to intuitively know HOW MANY objects are in a small group) and become familiar with basic numbers and counting, we can expand early math investigations and begin to introduce the concepts of: Greater Than, Less Than, and Equal To. To add an element of fun to learning math, the Pac-Man inspired Wikki Stix creations are sure to be a hit with your kids! Discuss the symbols for greater than (›), less than (‹), and equal to (=) with the children. Materials needed to create each Pac-Man character: Yellow Wikki Stix, black Wikki Stix, and scissors. LESS THAN: Give each child 2 yellow Wikki Stix. Have the children create the letter C with one of the yellow Wikki Stix. The second Wikki Stix should be cut in half. Invite the children to then make the < symbol with the yellow half (or the letter V turned sideways). The symbol can then be attached to the ends letter C to form the mouth opening for the Pac-Man (see photo above). Older children may wish to fill in the basic Pac-Man shape and create the eye with additional Wikki Stix. GREATER THAN: The greater than Pac-Man character is a reversal of the less than character. Have the children create a backwards letter C with one yellow Wikki Stix. The children can use the ½ yellow Wikki Stix (left over from creating the less than symbol) to form the > symbol (the mouth). If desired, older children can fill in the character with additional yellow Wikki Stix and use black Wikki Stix for the character’s eye. EQUAL TO (SAME): This character is made from two Wikki Stix. Have the children create the Letter C. The = symbol is made by using one Wikki Stix (bent in half to make a V and turned sideways). Invite the children to close the V (mouth) shape slightly before attaching to the ends of the Letter C (see photo above). If desired, older children can fill in the character with additional yellow Wikki Stix and use black Wikki Stix for the character’s eye. When the Pac-Man inspired Wikki Stix characters are created, tell the children that Pac-Man’s mouth will always open to EAT the larger number. If desired, Wikki Stix spirals (one Wikki Stix wrapped around itself into a spiral) with numbers can be created for hands-on practice with less than or greater than (as in the photo above). 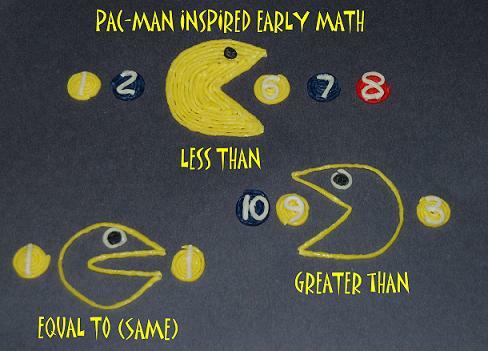 Remind the children that when the numbers are the SAME, Pac-Man’s mouth closes slightly to make the = symbol. Extension Activity for Older Children: Add a craft stick to each of the characters. 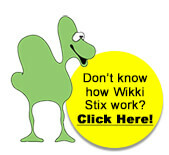 The Wikki Stix will adhere to the craft sticks without glue or tape. The children can use the stick puppets to create stories with math problems and put on a puppet show for their peers. 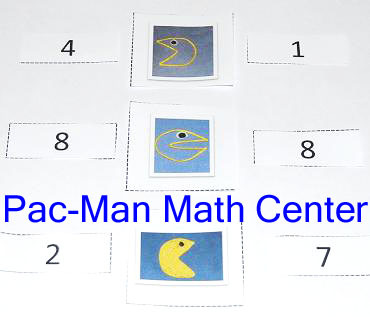 Materials needed: One PacMan Math Free Printable (separate download) and Wikki Stix. Print the file and have the children cut out the numbered cards and character pictures (located at the end of the file). The children must then draw two numbered cards and determine what character card displays the relationship between the two numbers (greater then, less than, or equal to). The children can cut Wikki Stix in half and use the Wikki Stix to create the greater than, less than, or equal to symbols and place the appropriate symbol in the center box. The children can use the stick characters (created above) for use with the number cards provided in the file. Note: the second page of the file is intentionally left blank to write in additional numbers the children may be working on or have had introduced.